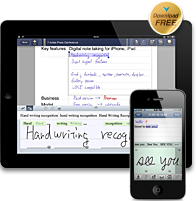 7notes Web Client is an iPad app that combines the handwriting recognition and prediction technology “Mazec” and a web-browser. On the 14th of February we will release an on-demand webinar that explains what the 7notes Web Client looks like, how it works, and what is needed to use it. Unlock the freedom of handwriting within your companies existing web based applications. We will explore how the technology works, what is needed to enhance your users experience, and also some of the case-studies in which benefits have already been delivered. If you would like to be alerted as soon as the webinar is ready then please email infoen@7knowledge.com and we will update you.